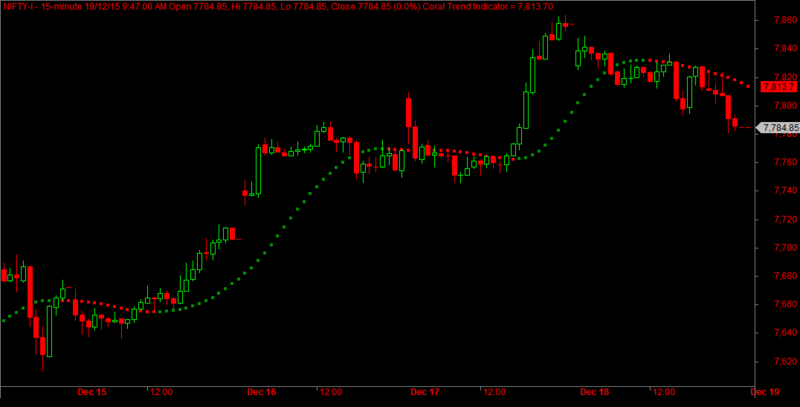 Coral Trend Indicator is yet another trend following indicator inspired from Tradingview Pinescript code. Code is designed to plot in PSAR style. Green color dots represents bullish trend. and the red dots represents bearish trend. 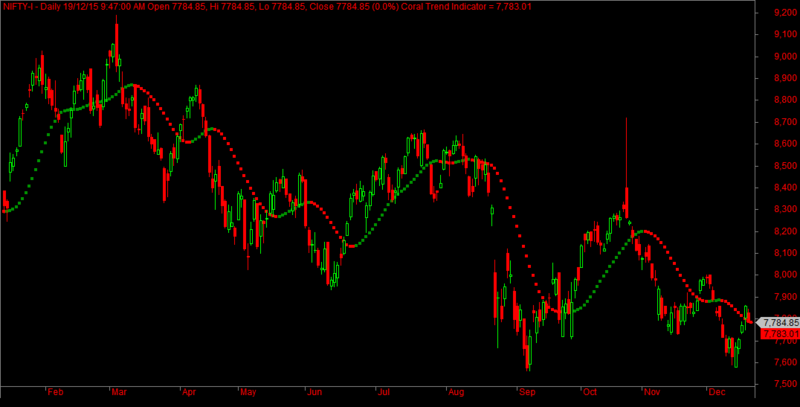 Coral trend applied to Nifty EOD charts as shown in the above figure. Looks like the system is quite popular in MT4 platform among FX traders known as THV Coral. Whatever the code does is just the indication of trend and not a complete system though. Do you home work if you would like to build some system on top of it. The download link gives the same code with repainting problem. Please update the link. Enjoy, CArnot. Take the code from the Github Code. Download link is not yet updated. Now the download link too updated with the new file. As said in previous post if possible please modify COREL TREND. IN TO MULTI TIME FRAME. Yes It would be excellent if Coral can be coded for multi time frame. Which means the buy signal would be generated in 5 min chart when 15 min chart turns green and in reverse sell would be signalled in conjunction with 15 mind chart or 30 mins chart. Even if there is a way to notice coral trend higher time frame indicator in lower time frame it would be excellent. Not better use this function instead looping.